The only dekaranger minipla I own is dekawing. I missed my chance on dekarobot and dekabike robot minipla but I found a soul of chokogin version of dekarobot. Don't have the dakabike robot for now. Dekabase is quite ugly and I found another toy version that is more beautiful and only a bit taller than a minipla (not the dx size). I don't really have a favourite. I loved them all... I could say shurikenjin as it was the first one I bought while travelling in Japan. At that time I wasn't sure if the result would be great or not and that I would end buying a lot after that. Super miniplas are also really great as they a more detailed construction pattern. Wow! Very nice section of your collection I am very much looking forward to getting the items I've purchased and from what you're saying about Super Mini-Pla construction being even more complicated, I'm even MORE excited! Are those multiple copies of other Super Mini-Pla on the shelf above? Very cool! Did you manage to get all the Shurikenger Mini-Pla? 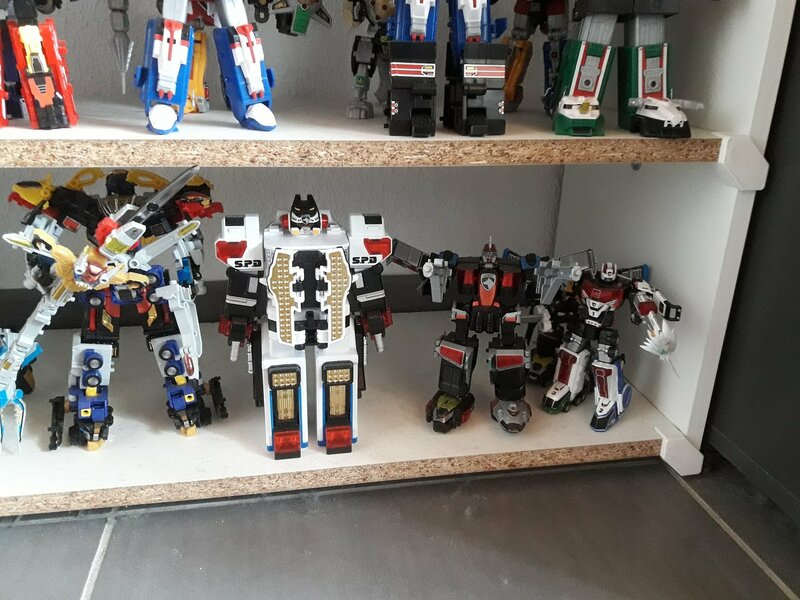 Yes, I tried to have most of the robots, including gattai, so I have several copies for some of them, if I can find them ! That's a lot of awesome!!! Just seen the new scans for Ryusoulger mech. Lots of awesome mech coming! Can't help but wonder how the next few sets of MiniPla are gonna pan out. As in, what mech in what set. Do they usually do MiniPla for the movie mech? It usually go out on august. So it should be set 04. I'm thinking set 02 should be Tigerlance and Mineedle, though not sure what would round out the set? Perhaps the raptors? Guessing Dimevolcano may come in set 03 but only time will tell. I've already pre-ordered set 03 but not found anywhere to order set 02 as of yet, if and when I find it I shall post it here. Dunno if I will bother with the movie set but THE GOLD LOOKS SO NICE. I'm not bothered about glitter set but I hope it's mass release or an exclusive at least for those who want to get their hands on it. Also. Jet Icarus looks amazing and I hope to pick it up at some point. Never watched any pre mmpr Sentai by the design of that mech has always been lovely to me. That and Liverobo which I missed out on haha. Got into the line too late! Last edited by Gero; 04-10-2019 at 04:27 PM.. I agree for tigerlance and Mineedle. Dimevolcano could with it or set 3. Not sure for now. Perhaps a complete set with kyshiryoh to be able todo kishiryu five knight, but they have never re released a set so soon, so I will not bet on that. But it usually follow the release of the DX toys. Usually the same month, sometime later (vs vehicule splash,magig, victory striker and siren striker were only released in november last year) . Jet icarus and garuda looks really great, I raelly hope they continue to do all sentai robots in the superminipla line. If you can get an hand on galaxy mega (and delta mega), it was release in january. Really great too. That's another set I regret missing out on as it's a DX set I never had when I was younger. I REALLY hope they do the GoGoFive mecha line. That will getting pre-ordered immediately! There any other series of mech that you're hoping gets the Super MiniPla treatment soon? Ah a very wise decision! I thought about going all in on Gaogaigar but only got the 1st set, and HoRyu and EnRyu coming. As good as the rest looks, they all very similar molds other than GaoFar!